Recorded in a wide variety of spelings including Alban, Albion, Albin, Alabone, and Aubon, this unusual and interesting surname is English but of Roman origins. It derives from the male given name "Alban", itself from the Latin "Albanus", originally an ethnic name for a "man from Alba" the then capital of the early Roman Kings. Alban was throughout northern Europe where it was given in honour of St. Alban, the first British martyr in the 4th Century. Various legends give the town of St. Albans in Hertfordshire as the birthplace and the place of execution of this saint. 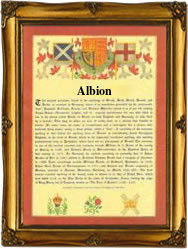 Early examples of the name recording include Albanus filius Willelmi in the Curia Regis Rolls of Yorkshire for the year 1212, whilst Adam Albon is listed in the 1275 Subsidy Rolls of Worcestershire, William Albone in the Calendar of Letter Books of the City of London in 1376, and Ann Albion, in the register of the church of St Mary le Bow, London, on June 5th 1556. One of the earliest emigrants to the New World of the Americas was Alice Albon, who departed from the Port of London, aboard the ship "Hopewell", bound for Virginia in September 1635. The first recorded spelling of the family name is shown to be that of Walter Alban, which was dated 1250, in the Buckinghamshire "Book of Fees", during the reign of King Henry 111, known as "The Frenchman", 1216-1272. Throughout the centuries, surnames in every country have continued to "develop" often leading to astonishing variants of the original spelling.